There are obviously verifiable vote fraud problems in North Carolina. Perhaps in an effort to promote North Carolina as one of the healthiest States in the Nation, this latest voter twist comes to us from Susan Myrick of the Civitas Institute in North Carolina–not to be confused with Rep. Sue Myrick of NC who is unrelated. In a radio interview with local WBT Anchor Tara Servatious, Susan reports that she has been keeping track of the number of votes in North Carolina of individuals over the age of 110 years and apparently we have quite a few, over 410 of the 110 year olds–to be exact– actually voted via absentee ballot on October the 28th. Yes indeed, now it would appear that good ole NC has the market cornered on the Centenarian vote. At latest count, Susan has garnered a total Absentee Ballot vote of over 2,660 people over the age of 110. Someone contact the Guiness Book and warm up the Ford, the Fountain of Youth exists and its right here in lovely NC. It’s no wonder people are moving here in droves–maybe the use of tobacco isn’t such a bad thing after all? But, on a more serious note, with all of the irregularities going on all over the place, we can now begin to wonder about a few things. Apparently those ultra-healthy seniors over 110 have aged and are now astoundingly over 112 years old, and are still able to make it to the polls ahead of time. According to a post originally from the Silence Dogood political blog report, there were at least 758 individuals over the age of 112 who had either risen from their respective graves, or otherwise, to vote once again for the Democrats in charge, who might apparently have also guaranteed them an ever-lasting vote for life and beyond. 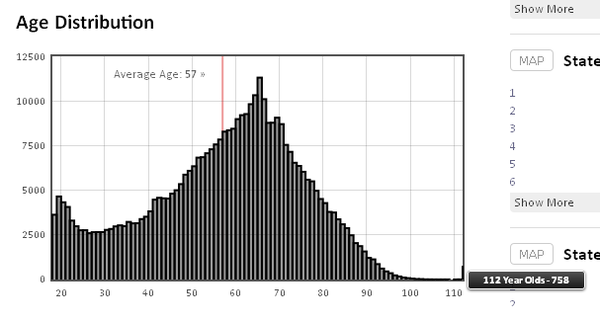 In visiting the political tracking site, we later found the same story in evidence, except the number of centenarian voters had increased measurably to 832 voters over the age of 112. Of these voters, over 70% were slated as Democrats, with a diminutive 25% counted as Republicans. The rest were unaffiliated. When peering a little more deeply at the numbers we find that an astounding 2,374 people between the ages of 94 and 100 have already voted in the NC election to date. While an even more astounding 832 votes came from those individuals aged 112. However, according to the Guinness book of world records, the oldest living person in the world, at present, lives in Japan and is 114 years old. It would seem obvious that, according to the NC vote registry, this old fellow might be nudged aside in the near future, especially considering the crop of spry 112 year-olds seemingly alive and well in the old North State. In fact, two of the 112 year aged voters were mail-in ballots from overseas; ostensibly vacationing to escape the now bitterly polarized political contest, and who can blame them? This entry was posted in 2012 Primary, Treason, True Talking Points and tagged civitas institute, fraud problems, politics, silence dogood, sue myrick, vote fraud. Bookmark the permalink.